Nutmeg is a classic baking spice, and for the freshest taste and boldest flavor, it’s best to use whole nutmeg. Just grate the brownish seeds using a microplane or spice grinder. And voila! You have fresh, cinnamon-like bittersweet nutmeg that’s perfect for spicing muffins, cakes, sweet breads and savory dishes. Generally, whole nutmeg is known for its bolder flavor and more pungent aroma. Unlike ground nutmeg, fresh whole nutmeg retains all of its essential oil content. (That’s what gives it that woodsy, warm taste.) And therefore, you typically can use less of it than the ground spice to achieve that delicious, spicy-sweet taste. Nutmeg does double-duty in the kitchen. It complements sweet and savory dishes, and you’ll find the spice in recipes from nearly every continent. Baking – Nutmeg is a favorite warm spice, along with clove, cardamom and cinnamon. And it’s most commonly found in spice cakes and spiced cookies. The spice pairs perfectly with dairy-based desserts and custards, as well. Garnish – Grate some nutmeg over a cup of tea, whipped cream or cocoa for a burst of bold flavor. Freshly ground nutmeg also looks great on baked goods, rice pudding and ice cream. Stews – Nutmeg’s warm and woody flavor complements hearty stews perfectly. You’ll find it in many recipes for French ragouts, as well as tomato-based stews and sauces. Rubs and Blends – Nutmeg is widely used in the world’s most popular spice blends. 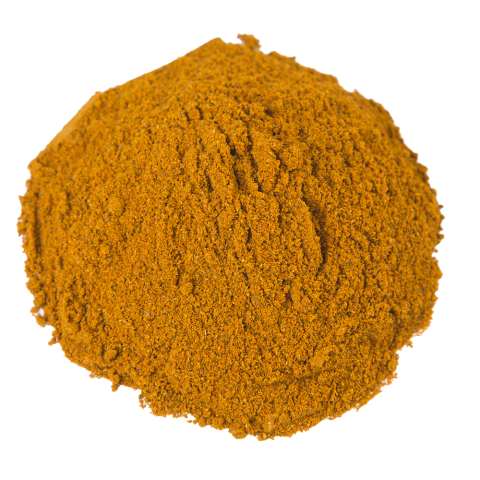 You’ll find ground nutmeg in curry powders, Garam Masala and Caribbean jerk seasoning. Its flavors also enhance and balance meats like pork, lamb and mutton. Starchy Side Dishes – Nutmeg can help balance and bring depth to potato dishes. It pairs nicely with sweet potatoes, pilafs and cous cous. One tip: When using fresh nutmeg, just grate as much as you need for the recipe. A half-grated pod retains all of its essential oils, as long as you keep it in a cool, dry place. Nutmeg is a native of the Moluccas, or Spice Islands, a chain of volcanic islands in Indonesia. The spice has been widely used and distributed for thousands of years. Nutmeg wasn’t commercially exported for hundreds of years. Yet, during the spice trade years, nutmeg provoked bloody battles, as exporters fought for sole ownership of the nutmeg trade. The Dutch and English often battled for control of the Spice Islands. It wasn’t until the 17th century that the score was settled. The Dutch traded Manhattan in New York (then called New Amsterdam) for control of the remaining English-occupied Spice Island. Today, Indonesia and the Spice Islands continue to produce much of the world’s nutmeg. In fact, in 2013, Indonesia accounted for 75% of all nutmeg produced worldwide. 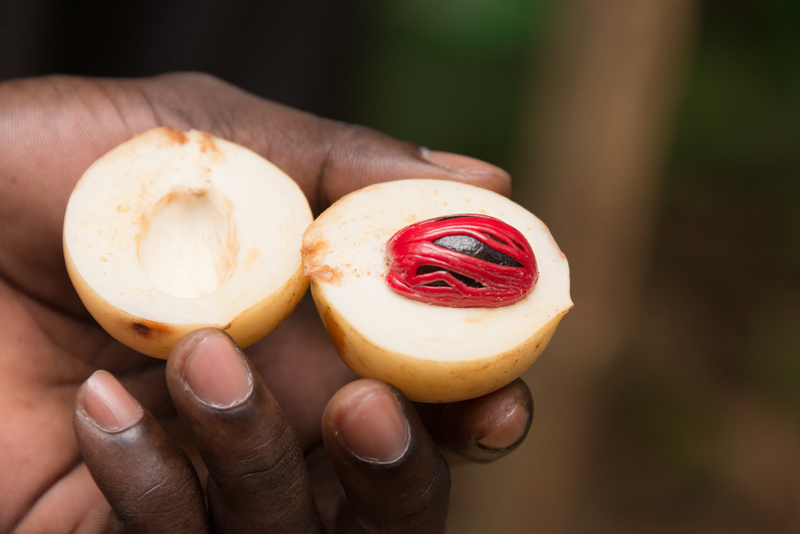 Many West Indies islands, including Grenada and St. Vincent are also exporters of nutmeg. The nutmeg tree is an evergreen varietal that thrives in tropical climates. Indonesia, and especially the volcanic Spice Islands, offer prime growing conditions for the tree. Nutmeg trees don’t grow too tall – they rarely grow over 40 feet in height with a 5-8 foot spread. The trees produce a small pear-shaped fruit, which is the source of two spices – nutmeg and mace. The yellowish fruit resembles a small pear, and inside it grows a seed pit. The seed is used to produce nutmeg spice, and it resembles a walnut. The outer fleshy part of the fruit – called the arid – is used to create mace. Mace has a similar flavor to nutmeg, without the bitter flavors. Many chefs use mace as a substitute, if they prefer a sweeter, more balanced flavor. Burma Spice works with growers in the Spice Islands to source our whole nutmeg. The islands are some of the most beautiful in the world, with lush, mountainous jungles and sparkling blue oceans. Thanks to the region’s volcanic soils, Indonesian-grown nutmeg consistently has higher levels of essential oils. As a result, the nutmeg has a bold, robust flavor. We purchase whole nutmeg in bulk from small Indonesian farms. And we process and package the whole seeds in our Florida spice shop.